Robert Patrick Masterson was born January 6, 1915 in North Branch. He grew up in Roselle and played basketball and football in Abraham Clark High School. Bob was big, fast, and coordinated. He had soft hands, quick feet and a powerful leg for kicking and punting. Bob received several scholarship offers and chose to play in warm weather at the University of Miami. Bob was a three-year letterman on the varsity, playing end on both offense and defense, and handling the team’s kicking duties. The U’s football program was starting to take off when Bob arrived. Entering his sophomore year there were rumors that Red Grange would coach the team. That didn’t happen, but Bob distinguished himself as the greatest player in Hurricanes’ history by the time he graduated, earning All-America recognition. Bob was also a member of the Miami boxing team. 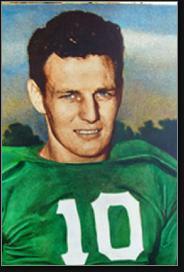 In the spring of 1938, Bob became the first Miami player to be drafted by an NFL team. He was the 50th player taken, by the Chicago Bears. 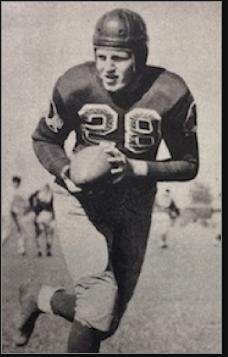 Bob was traded to the Washington Redskins before the season, and along with Charley Malone and Wayne Millner became one of Sammy Baugh’s favorite targets. In 1940, Bob was part of the team that lost 73–0 to the Bears in the NFL title game. In 1942, Bob was named one of the team’s co-captains. That season, the Redskins avenged their defeat by beating Chicago for the championship 14–6. Bob booted both extra points for Washington. The two teams met again in 1943, but the Bears came out on top 41–26. Bob was a First-Team All-Pro in 1942 and earned All-NFL honors from the Associated Press in 1942 and 1943. In 1944, the Redskins traded Bob to the Brooklyn Tigers. Despite the presence of Bob and veteran Ace Parker, the team went winless and in 1945 merged with the Boston Yanks. They improved by three victories, but Bob wanted out. When he heard the new AAFC was starting play in 1946, he returned home and signed with the New York Yankees. Teaming up with Parker and workhorse runner Spec Sanders, the Yankees went 10-3-1 to win the East. It marked the fourth time in seven years Bob played for a dvisiion-winning team. The Yankees led the Browns in the AAFC Championship 9–-7 in the 4th quarter, but Otto Graham hit Dante Lavelli with a scoring pass to win the game. Bob was in his 30s and looking to retire when he was offered an assistant coaching job with the University of Toronto. Canadian football was more wide-open than the NCAA or NFL, but Bob picked the game quickly and in 1948 became the Blues’ head coach. He led Toronto to the Yates Cup (the oldest football trophy in North America) in 1948, 1951 and 1954 and developed some of Canada’s top players, including John Evans, Don Fawcett, Fraser Mustard, Steve Oneschuk and Peter Potter. Bob’s record was 41–18–4 and he also coached the Toronto basketball team. In 1956, Bob was hired as GM by the Calgary Stampeders of the CFL. In 1957, he was fired after slapping a player for dropping a punt that cost the team a game. Bob had coached high school ball while playing for the Redskins. He returned to South Florida to continue his career on the sidelines. He was inducted into the University of Miami Hall of Fame, the Florida Sports Hall of Fame and the University of Toronto Sports Hall of Fame. Bob passed away in 1994 at the age of 79.